Aah, the French and their love of Madeleine Castaing fabric. And really, who can blame them. The prints are colorful, romantic, bold, timeless, and a bit quirky- much like Castaing herself. A few weeks ago I bought a book titled The French Touch , and I found that page after page was filled with French rooms that were bedecked with various Castaing prints- some homes featured not one but many. Who knew how well her prints worked together? One designer who is quite skillful at mixing Castaing fabric is Bruno de Caumont. 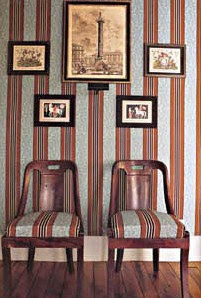 Although not featured in the above mentioned book, de Caumont's former Paris apartment garnered widespread acclaim a few years back because of his deft use of Castaing prints throughout his home. Of course, being the creative director of Edmond Petit (the company that produces the Castaing collection) may explain his enthusiastic use of her fabric, but I think he really did a smashing job. What I find curious is that you don't see these prints used often in American interiors- only Carolina Irving's home comes to mind. Perhaps we need to remedy that. In the meantime, here are various French homes that show the beauty and range of Castaing's designs. In this dining room of a chateau in the Bordeaux region, designer Jean-Louis Riccardi used "Coppelia" in this gorgeous blue colorway. 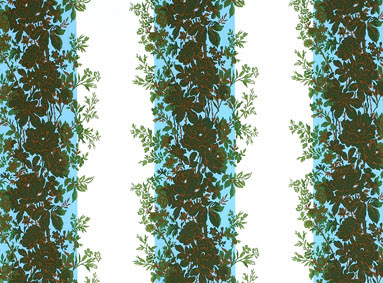 This print, in this wonderful shade of blue, is one of my all-time favorite fabrics. Again, de Caumont chose a Castaing print to cover this daybed in his home in Paris. 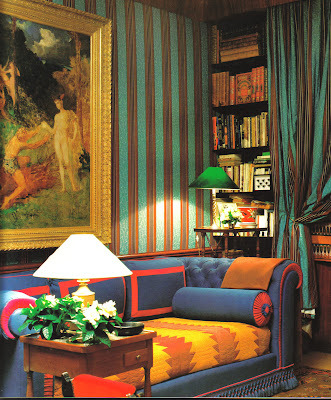 Fashion designer Gilles Dufour chose "Rayure Broderie" in the blue colorway for his sofa in his Paris apartment. 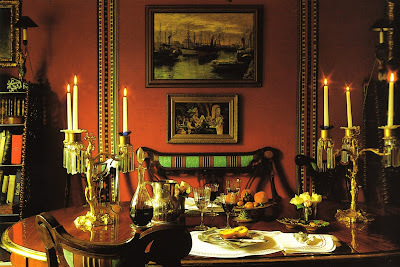 In the same Bordeaux chateau as above, Riccardi, like Dufour, chose the blue version of "Rayure Broderie"
"Castiglione" on the walls of Gilles Dufour's Paris apartment. de Caumont's apartment with "Castiglione" on both the walls and the chair seats. 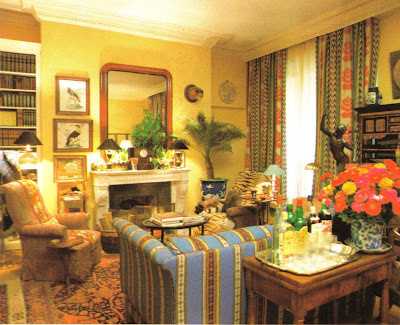 This room, in the home of Alexandre Zouari, was actually designed by Castaing herself. 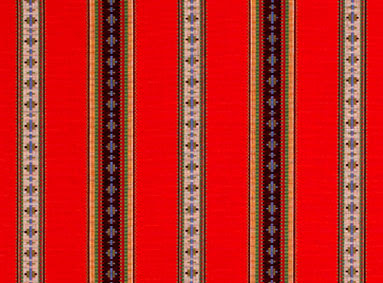 Notice how she used "Rayure Cachemire" as bands that divide up the red felt wall into panels. 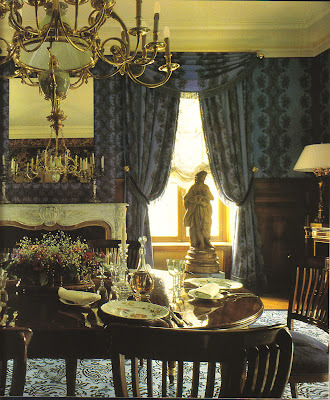 She also used "Castiglione" for the Austrian chairs and settee. Image at top: Castaing in a chair which appears to have "Coppelia" upholstered on the back. Photo by Derry Moore. Gazing in admiration of these stylish interiors I was struck by their quirky sense of authority. It cannot be easy to use Madame Castaing's printed materials, which are anything but reticent. Yet these examples manage that difficult feat, and wonderfully so. 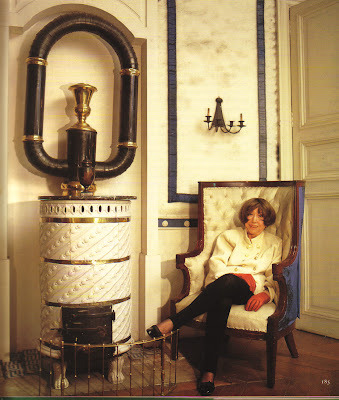 The image of Madame in that odd chair next to an equally odd "stove" with its pipes outlined in black, makes you understand that she was a law unto herself. Brava, Madeleine, and Brava, Peak! Thank you Toby! She was a law unto herself, but for some reason that photo of her makes me a bit sad. Ohhh, how I miss her shop! 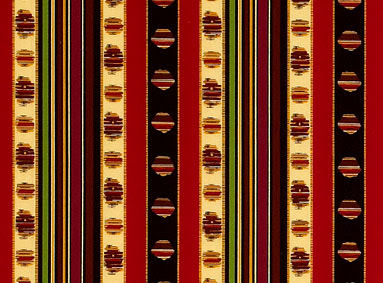 I first saw it in 1963 (as a very young design student) and I believe I saw all of these fabrics. It's loss has only been softened by it being replaced by a Lauduree (decorated by Jacque Garcia) and their pastel Macaroons and spiced tea! Great post--she was (and is) an inspiration to so many American interior designers, including Billy Baldwin. 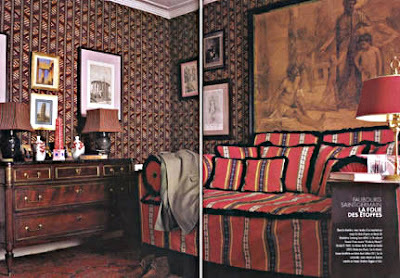 I believe he used the print Rayure Broderie in Nan Kempner's New York bedroom, combined with a poppy patterned fabric. 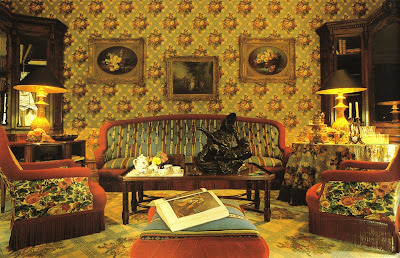 I saw it recently in a photograph of a room by Michael Smith, too. I'm curious as to why the photograph of her makes you sad, Jennifer. Is it the wig with the strap that goes under her chin? Supposedly, she told people that that (the strap) gave her an "instant facelift"? Aesthete- What a striking combination. I don't know if I would have thought about doing the green and white miniature check with Rayure Fleurie, but I think that sounds wonderful! Will- How lucky that you were able to visit her shop. Do tell us what it was like! Morris- You have such a good memory. 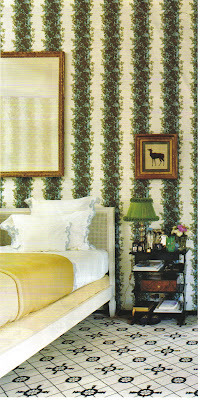 I wrote a post on Kempner last year (http://thepeakofchic.blogspot.com/2007/01/nan-kempner-american-chic.html), and you're right, it was used on the headboard, the bedding, and the fabric behind the headboard. Love the fabrics, hate the photo of her. Very morbid. Is she sitting there dead?! Anon- I know! I know she was a character, especially with the wig chin strap and such. But for some reason, that photo is a bit depressing. At first glance, "Coppelia" seems to fussy for my taste, but it makes such an impact once you see it up on the wall. I am digging the black and white version with the warm patina, wide-plank floors. They strike a nice balance. Vignette- That black and white version is really graphic. 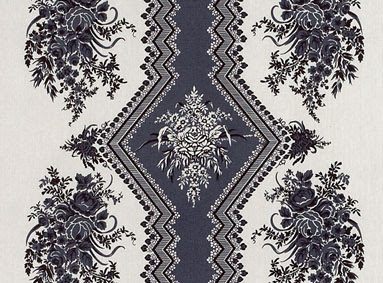 Normally I'm not drawn to prints like this, but there's something about "Coppelia" that is really charming. Rayure Fleurie is a longtime favorite of mine as is Madeleine Castaing. What a character! 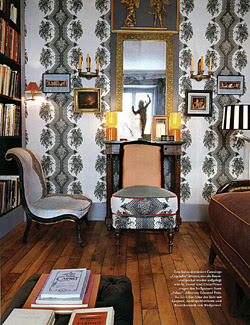 Bruno de Caumont's apartment is fabulous, as is his use of her prints. Sounds like a great book too! Great post Jennifer. I am crazy for the home Bruno de Caumont! Some of these are amazing. Do you mind if I reblog them? 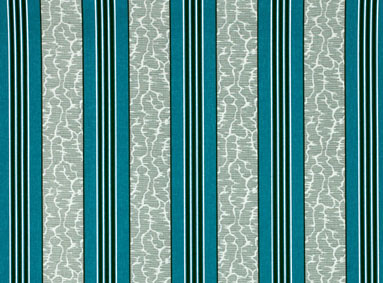 I love Madeleine Castaing's fabrics!! I would say everything she used to own were amazing, hopefully there's still her showroom! :) Great blog by the way!